Having lived the most public of lives, Tiger Woods has inevitably inspired a number of biographies. But the titles hint at the elusiveness of the subject: In Search of Tiger and Chasing Tiger come to mind immediately, while The Big Miss also evokes the frustration of trying to know the unknowable. Some of the books about Woods have been quite good, but those focus on a particular slice of time (the early days, in John Strege's Tiger) or hone in on one aspect of his complicated life (the influence of Earl, in Tom Callahan's His Father's Son). Now, at last, we are going to get a definitive biography of one of the most important and enigmatic athletes of our time, in Tiger Woods by Jeff Benedict and Armen Keteyian. It will be released next May by Simon & Schuster, a 150,000-word opus that is the result of three years of painstaking work and more than 400 interviews. "We feel like the book is comprehensive, immersive and detailed," says Keteyian, in the first public comments about the project. "It's a 360-degree panoramic view of his life. And even Earl and Tida's life, which is just as important in many ways." Keteyian is an Emmy award winner known for investigative pieces on 60 Minutes, HBO's Real Sports and ESPN's Outside the Lines. Benedict is the author of 12 books on a wide array of subjects. They collaborated on the 2013 expose The System: Glory and Scandal in Big-Time College Football. In searching for their next project they kept coming back to the Woods's sweeping life, which Ketyian describes as "Shakespearean." 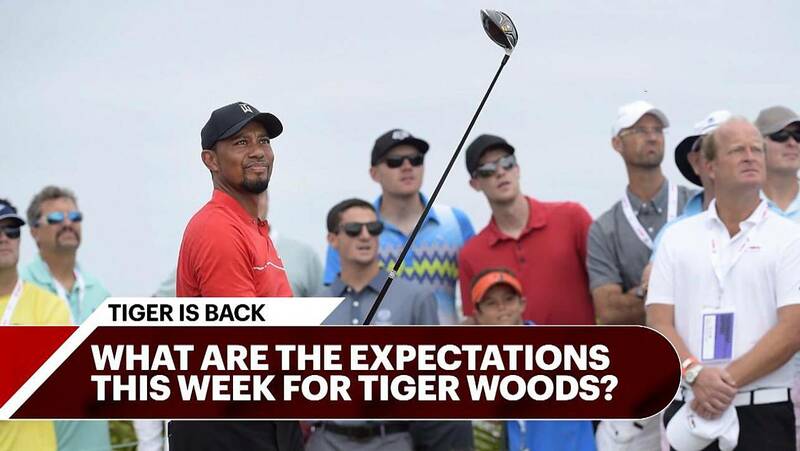 But given that Tiger has spent four decades being singed by the spotlight, what was there left to say? The book will go on sale in May. "I'll tell you what our mandate was," Benedict says. "The mandate was to have something new on every page of this book. That was a high bar that we were given by our publisher. And, frankly, at times it was a little overwhelming to both of us. But now that we're at the end, we can say we were able to achieve that." Doing so required what Keteyian calls "the full weight of our journalistic investigative abilities." Benedict adds: "There are a lot of people who can speak with authority and with experience about Tiger. We devoted a lot of our time to developing relationships with those people and learning from them firsthand: what they saw and what they know. In doing so we were led to a lot of people who haven't spoken before because they weren't on anybody else's radar. And because we had three years of time, we kept going back and kept going back, and kept going deeper. Many people who were afraid to talk to us eventually warmed up and did." Says Keteyian: "As to the question of why people will want to read this book, it comes down to all the new information we have. After the all the books we read about Tiger and the thousands of articles we waded through, we often finished an interview with someone who told us a bunch of stuff we'd never heard before. That didn't happen once or twice, it happened dozens of times." In golf circles it has long been whispered that Tiger Woods would focus on the question of whether or not the eponymous protagonist used performance-enhancing drugs, which he has always denied. Woods has been dogged by these rumors since the 2009 reveal that he was treated by Anthony Galea, the disgraced Canadian doctor who was arrested for smuggling human growth hormone into the United States. (In 2011 Galea pleaded guilty to a lesser charge of bringing mislabeled drugs into the U.S.) Benedict and Keteyian acknowledge that there is a meaty chapter in the book examining the PED question but at this moment are not at liberty to divulge any specifics. Authors Armen Keteyian (left) and Jeff Benedict. They go deep on all of the scandals, too, but the melodrama of Woods's life is interspersed with on-course action. "We help you remember how great he was," Keteyian says. "It is a refreshing of the memory of what genius is like. Some of the most famous moments are recreated, but they are seen through a different lens that will allow people to cherish what they were witnessing." Benedict doesn't play golf and claims to rarely watch it, but he adds, "I gotta tell ya, there were so many times where we finished a chapter and I was completely invigorated because of the drama this guy creates on the golf course. It's riveting stuff." As is his custom, Woods declined to be interviewed for the book, though his voice is present thanks to the wealth of interviews and press conferences he has given through the years. Throughout the exhaustive (and exhausting) process of researching the book, the authors came to feel competing emotions about Woods, just as their would-be readers have over the last quarter-century. While he describes Tiger Woods as a "psychological profile," Benedict says, "The job of the biographer is not to judge. Your task is to present someone's life in the fullest, most accurate portrait that you can. And then let the readers decide what they think and how they feel." Says Keteyian, "There's tremendous complexity to it. I believe this is the best piece of journalism I've done in 35 years, because of the scope of the story. It turned into much more than I thought it could be. It turned into a mountain." "In the end," Benedict says, "we climbed it."